Click on title for more Feedback! Located near Vidalia, in the middle of southeast Georgia - about 30 minutes from I16 and 1.5 hours from I95 access. HI! My name is Sabine and I am a poodle addict! I am German [Sie koennen mir gerne in deutsch schreiben] and grew up with toy poodles and fox terriers [or should I say terrors, LOL?] and assorted big farm dogs for companions. I have been owned by dogs and cats all of my adult life [some 30+ years or so] and I have been breeding for 17 - since 1998. 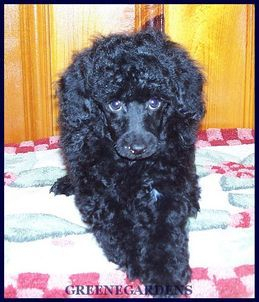 Many of the puppies you'll see offered on my website, go back all the way to my initial poodle breeding stock - in some cases 5, 6, 7 and more generations. I tend to know my dogs - after all I have not only bred their moms or dads, but more often than not their grand parents and great grands, and so on. Opposite to a lot of breeders, I tend to keep my dogs when they are old and most will stay with me until they pass away from old age. I sometimes place one or the other retiree, but most of them stay with me. I always get asked as to how many poodles I have. I generally keep around 15 "working girls", but in reality have double that number when you figure in the males, upcoming young stuff, and my old ladies that have retiree status. I raise predominantly mini poodle children these days [with the occasional large toys], but we still on occasion get a litter of Dwarf Doodles or PomaPoos. When available, these often sell to folks on our Waiting List and many never make it to be advertised on the website. If that is what you are looking for - feel free to ask if any litters are planned or babies are available and also check the Litter Announcement Page for updates. 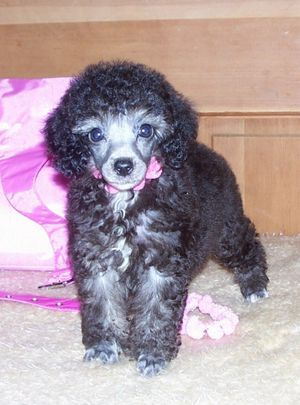 We also raise miniature poodles in the hottest new exotic poodle color - merles!!! 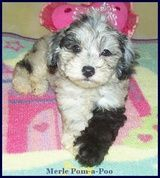 One of the gorgeous side effects of raising purebred merle poodles - we occasionally use a merle sire to father our poodle hybrid babies - and hence may have silver merle, blue merle and chocolate merle -Poos & Doodles in the 10-20# range [and occasionally smaller, depending on parent breed combination] available. Almost 18 years into my poodle breeding program - most of our available poodle kids are 3rd, 4th or 5th and now in 2015/16 we're getting to 6th + 7th + 8th generations. Meaning that I not only bred and own[ed] their parents, but also their grand parents and great grands and in some occasions even their great-greats and lately great-great-great-great-grands [whew - what a word]! First of all - it means we've "been there and done that" as far as learning experiences are concerned, and we'll continue to be here to stay and are available for support and advice after the puppy purchase as well. I am quite pleased to say that we have many multiple dogs in the same families - many duos, quite a few triplets and here and there are 4 or even 5 of our furkids living in the same immediate or extended family or friend circles. After well over 17 years of raising poodles, I take pride in my "KneeHugger" line. A loving & affectionate, intelligent, sensitive and sensible adult poodle is what you may expect when you spend quality time with one of our pups and raise it as a full family member. 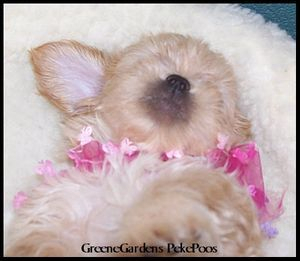 Our puppies are exuberant, happy and beboppy. Several of my adult dogs will hold hands to express their love for me. My hand in their mouth - very gently once they have learned what is ok and how much pressure is too much - and will sit or stand like this for however long I permit, others will hug my knees and ankles when I sit or stand still [never mind for everybody else mobbing for the highly desirable spot on my lap or topshelf]. If you spend the time to teach your pup basic obedience, spend lots and quality time with it and most importantly talk to it - you will NOT be disappointed with any of our poodle kids [unless you want a distant and aloof dog - none of ours are like that, you'd had to severely abuse one to get there...]. Wether you are looking for a laid back snuggle bunny, a child's first playful and forgiving pet or a cool, calm and collected companion for a senior citizen, or even a loving replacement to fill a void or empty spot on your lap and home - I'll know which of our pups will be most suitable to fit your needs best. Please note - pups and dogs that are shown anywhere else other than on the "Available" Pages are not available [unless otherwise clearly mentioned] - they are the [now adult] parents, siblings, aunts, cousins, great-great-grand parents etc etc of our current pups, or previous pups that are now in loving homes of their own. If you are contemplating one of our babies - pls take the time to read through the pages in the links at the top of each page and in the side bars. My website is huge - there are well over 100 pages overall and a lot if not most of your basic "Frequently Asked Questions" are answered somewhere in here. The info shared will not only help you to decide if this breed or pup is right for you and your family, it will also get you started in getting ready for a new pup, and raising your puppy up to being a loveable and affectionate dog. If nothing else - it'll give you an excuse to look at some photos of our previous pups :o). Bookmark our website as new puppies get added when available, I continue to add more puppy care info as I have time to write about it! Subscribe to my website for updates, new info added, special or unadvertised sales! Sabine & the Poodle Gang.